Tim Thomas was a hero in goal for the Boston Bruins in Game 2 of the Eastern Conference Finals. 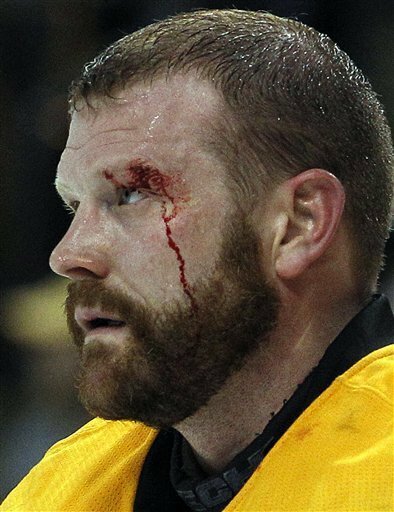 Tim Thomas of the Boston Bruins feels no pain, not even if a puck hits him in the face or gets stuck in his head. Ironically, it was a save that he didn’t make where he showed how tough he could be as Dominic Moore shot went off his face and into the net, after his own defenseman crashed into him, knocking his mask off. Thomas showed again Tuesday that you don’t have to save every shot to make big saves. Hmm I do not realy get it, possibly for the reason that I have to be a absurd glee fan, don’t know if you ever seen glee? It’s actually stunning, certainly amongst the best t . v . shows I actually ever looked at.